If you want to get traffic to your blog or website, but don’t know where to begin, this post is going to be your new best friend. Some of the strategies you may know already but I guarantee you will not be disappointed. If you are looking for even more blog growth tips, we’ve also collected 19 of the fastest and easiest to implement tactics to promote your blog. My goal is to provide you enough detail to easily implement the tactics you have not already put into practice. Every tactic is something we’ve tried to get traffic. We’re only sharing what has worked for us. ***This post is part 2 of the Ultimate Playbook for Growing Your Blog Traffic. Andy Merchant, Co-founder of Bloggers Required, inspired this series. He created an impressive list of 35 ways to get traffic to your blog. After reading through his list, I was compelled to do a follow-up post that shows you how to get traffic to your blog or website by implementing many of his great ideas. We won’t cover all 35 – some don’t require much explaining. However, others require a few steps and for that reason, I’ll expand upon Andy’s ideas over several blog posts. Andy Merchant: Your readers are most likely to judge your content by their titles. Titles with numbers, data, breaking news or funny twists will attract readers to your blog. 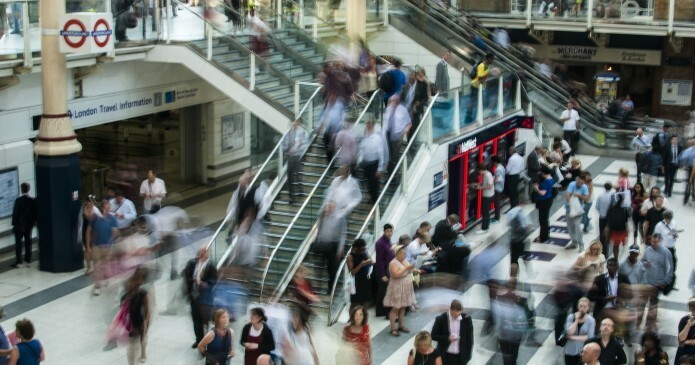 The tsunami of social media updates has turned us into skimmers, scanners, and browsers. Facebook alone sees 2.4M updates every minute while 400M updates flow through Twitter pipes every day. As if we were treading water keeping ourselves from drowning in a pool of updates, we spend nanoseconds frantically swiping, scrolling and thumbing through social media streams trying to find “the perfect one”. Whether it is smart, funny, or informative, something jumped out of the stream and demanded our attention as if it had superpowers. We click, and so begins our journey. I am talking about the headline. As the creator, you achieved your first goal. You moved us from browsing to reading. Your blog content lives and dies by the headline. The headline has always been important but more so today. Competition for attention is at an all-time high. Anyone can create content. Your competitor is just a thumb swipe away. Over 50% of content consumption happens on a handheld device. These real-estate starved devices lack the space for anything more than a headline showing in your stream. It is more important than any other time since the Gutenberg Press that we perfect the art of headline writing to get traffic to your blog. For example, Upworthy.com gets serious about headlines. They brainstorm up to 25 headlines for each piece of content. Their time is well invested. The perfect headline can get traffic to your blog by a whopping 500% according to their analytics. The headline must awaken a curiosity and create a hunger for new information. There are many different styles of headlines (intrigue, suspense, informative). Google is full of hundreds of how-to articles on writing compelling headlines. I wanted proof. What really works? 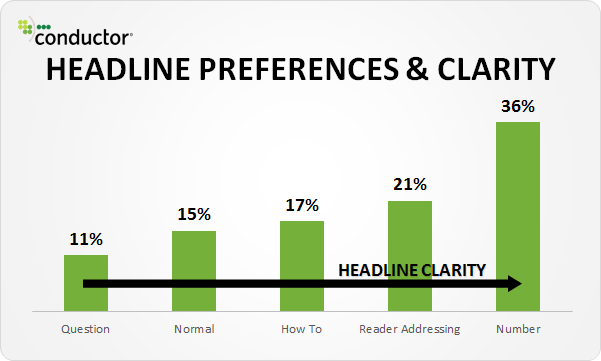 What headline type will get traffic to your blog? -> STOP using you, your, you’re, must or need or risk a 20%+ drop in clicks according to Outbrain. –> Use testimonials. LKR Social Media improved conversion by 24.31% using this technique. –> The “top x of something” headline format will get traffic to your blog, period. (e.g., 9 Irrefutable Laws for Writing Irresistible Headlines). –> Size matters. If you’re optimizing for SEO, keep the headline at 65 characters max. Google shows only the first 65 characters of a title. According to Outbrain blog headlines containing 60-100 characters perform the best. 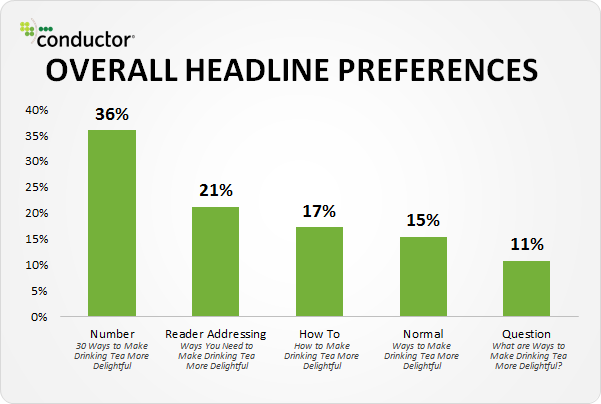 To get traffic most efficiently, research from the direct mail industry shows headlines should be eight words or less. Magazine copywriters have to write tight headlines due to space concerns, just like Twitter users. –> Be extremely modest or overzealous. Avoid the middle ground. 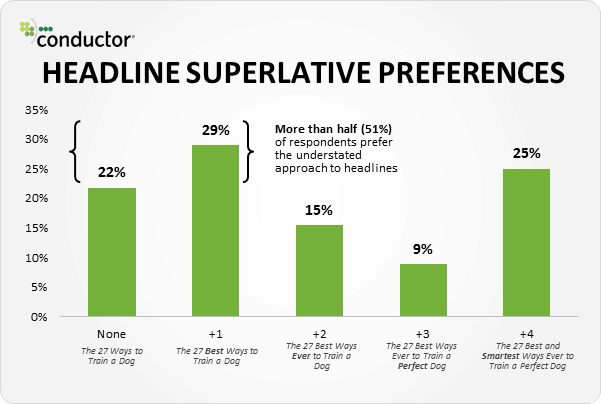 –> Readers prefer headlines written in sentence case. –> Tell readers exactly what they are about to read. Descriptive headlines get readers to click. 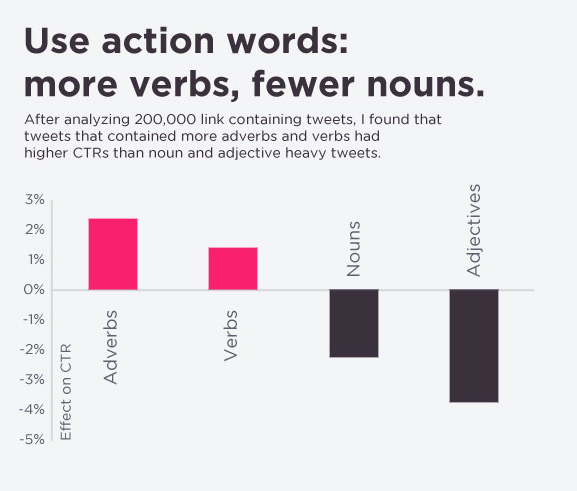 –>The use of verbs works to get traffic according to Dan Zarrella, Social Media Scientist at Hubspot. Andrew Merchant: Your current social media followers may be interested in your blog’s content. Therefore, as soon as you post something on your blog, share it on your social media channels so that your current followers can start reading your blog. In fact, they may also share the content and help to get traffic to your blog. I don’t think I need to convince you to share blog content on your social media profiles. What I will explain is how to use Smart Automation to get traffic. In this case: RSS, to significantly reduce the time it takes to do repetitive tasks like posting to numerous social networks. RSS feeds give readers a method to keep up with their favorite blogs, news sites, and other websites. Anyone can choose the sites they wish to subscribe to, and then get updates in one centralized location. In essence, RSS allows the content to come to you. That means you do not have to go to each blog or website individually when you want to view new updates they’ve published. Is RSS dead? Is RSS still an important Marketing tool to get traffic? The answer to the first question is No! Despite Google’s decision to shut down its popular Google Reader service, RSS is not dead. It may be true that end users are not subscribing to RSS feeds in feed readers as much these days. But it’s also true that RSS is everywhere whether people realize it or not. One way to think of RSS is like plumbing. It works behind the scenes to get traffic. It’s the pipes that make content portable on the Web. RSS is still a key way that content published on one site can be seen (either in full or perhaps with just a headline and short snippet) in other places. For instance, RSS is how a lot of content gets fed to social media sites like Twitter and LinkedIn in the first place. The answer to the second question is Yes! For bloggers and website owners, RSS is a great Web marketing tool to get traffic. It is a means to create a loyal repeat following. It helps you get traffic by keeping you top of mind with your readers. As a blog owner or website owner, it’s up to you to create and publicize your RSS feed. Most blogging software platforms make this easy because the software automatically creates RSS feeds. WordPress, for example, is one content management system that automatically creates an RSS feed for the site. The following are expert RSS to social media solutions to enable you to get traffic, increase views, grow reach, share your photo’s and video and ultimately, boost sales across social media. Andrew Merchant: Google Analytics will help you to keep track of your site’s traffic while allowing you to know how each section of your site is performing. Master how to interpret the software, it will help you a great deal. Here’s another case where you likely already know your way around Google Analytics. However, are you measuring Dark Social? With limited time and resources, it’s crucial to know what social media marketing tactics will get traffic. What have you missed – any untraceable links or lost referrer data hiding in a corner? According to the website analytics provider Chartbeat, nearly 70% of ‘social’ sharing goes untracked while only 25% of sharing occurs on Facebook and Twitter – combined. The term to describe this is Dark Social. Have you ever copied and pasted a link into email? If you have, you just participated in Dark Social. Dark Social is the blind spot in website analytics. In many cases, you can tell which sites people were on before coming to your site. This information is helpful in determining where to spend your time and marketing money. Dark Social refers to traffic not attributed to a source. It’s hard to measure because it happens when users copy, paste, and then share a link through email, apps, bookmarks or on chat. It’s outside the basic core of the social media ecosystem. This “void” means a huge goldmine of valuable traffic and customer data remains untapped and bypasses traditional analytic systems. Alexis C. Madrigal, a senior editor at The Atlantic, coined the term Dark Social. Most analytic systems report Dark Social as either unknown or direct traffic. The ‘direct traffic’ category implies that someone typed in your URL directly. That might not be the case. The truth of the matter is that the information we get from web analytics tools is limited. The vast majority of social traffic may be invisible to most analytics programs. Credit to Chartbeat for this tip. Dark Social is all those visitors who don’t have a referring site but excluding those people who arrived at the home page. Using Google Analytics as an example, the left image below shows the ranking of our “Direct” traffic for a given period. Clicking on the link displays the landing pages in which the direct traffic entered the site (see image on the right). If we assume direct traffic to mean someone directly typing in one of our URL’s, that would mean a visitor would have to know the exact URL of one of our articles on the blog which is not likely. What is more likely the case, this traffic represents visitors originating from a Dark Social source – email, apps, pasted links or on chat. On the right image below at number two, the slash (/) you see is traffic that is more likely ‘direct’ – people typing in blog.dlvrit.com (as well as other links pointing directly to our blog homepage). 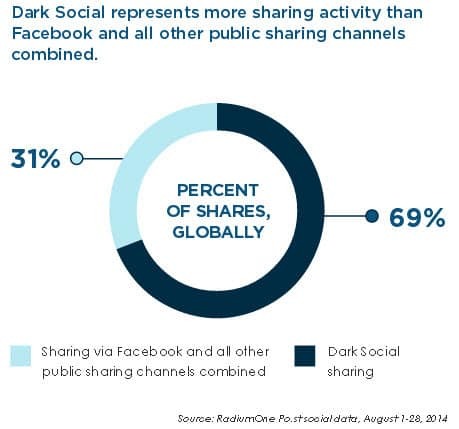 According to RadiumOne, 93% of consumers share content via Dark Social. This iceberg under the water is an incomplete picture and can cause marketers to dump resources into the wrong channels. However, is it realistic to identify all this hidden sharing activity and the users behind it? The short answer is no. However, you can create a bit more of an aggressive plan to classify the unknown or direct traffic. Here are three low-tech ways to gain a clearer picture of the source of Dark Social traffic. Of course, this relies on a reader to copy and paste the entire link. Learn how dlvr.it automates the process of adding UTM parameters to ALL the links you share across social media. When sharing content outside your site, mask the link with a shortened URL. When combining trackable codes (from step 1 above) and a short URL, you will have a barrier of protection. The short URL is short enough to paste into email, chat, and text. When clicked, you will know where the link originated from because you have the UTM parameter enabled. This code will then register with your analytics program. A significant portion of Dark Social traffic comes from readers copying and pasting content from your website. Services like Tynt have been trying to solve the copy and paste tracking issue for some time. Tynt is a code you can add to a website, and their WordPress plugin makes installation easier. Without copy and paste tracking, when a reader copies a portion of a page, the text alone is pasted into the destination. No other metadata is attached. With Tynt installed, now when the user copies a portion of a page, the copied content is automatically wrapped with a URL. Nothing is full proof, but you can make great headway in classifying traffic correctly in your analytics program. 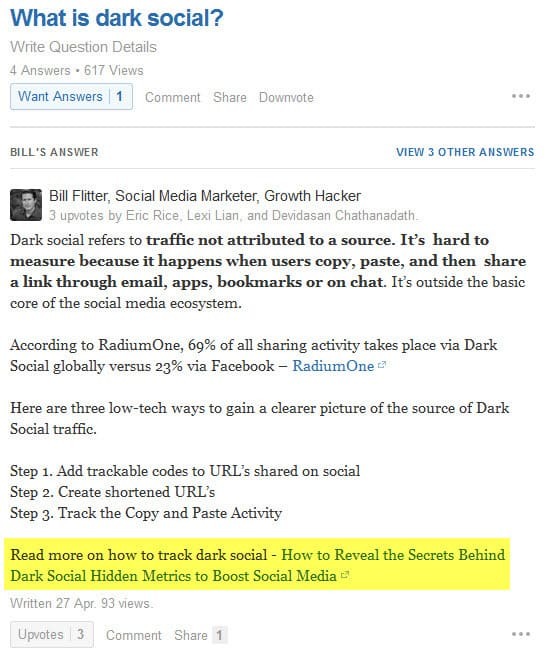 Dark Social is a big enough piece of the pie that taking the time to quantify and identify the source is worth the extra effort. Andy Merchant: Email marketing is a powerful tool for building a steady audience for your blog. Start building your email list as soon as possible. Having a healthy email newsletter should be a priority of every small business to get traffic. Email marketing is one of the most heavily used communication channels to date and is considered the third overall most effective channel for lead generation for marketers, producing 13% of all leads. According to the Direct Marketing Association, email sees the highest ROI for direct marketers at $39 for every dollar spent. An Adobe study says millennials check email more than any other age group, and nearly half can’t even use the bathroom without checking it. In fact, 98% of millennials check their personal email, at least, every few hours at work, and nearly 87% of millennials check their work email outside of work. For most people, submitting an email address is like handing over cash. As a newsletter publisher, you should view the transaction as such. →Does your opt-in process look safe? →Do you feel confident leaving your email address? 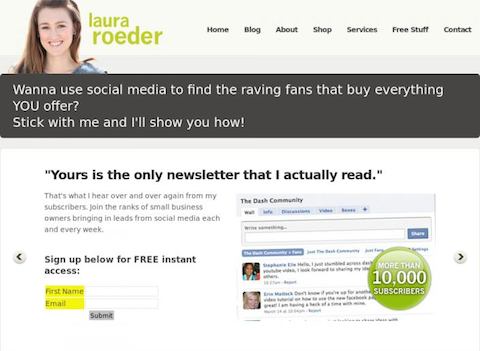 Want more opt-ins to your newsletter? You need to ask visitors to sign-up and make it super simple. There are many elements to consider when creating the perfect email newsletter. Knowing what they are will help you optimize them for best performance. We tested each of the following components, and they have proven to have an impact on open and click-through rates. The “from name” can be as important as the subject line because subscribers won’t open emails from people they don’t recognize. Use the “from name” to say who you are as the sender, and keep it consistent over time. For example, our “from name” for the dlvr.it blog is ‘debra at dlvr.it’ (one of our blog writers). We experimented with different author names, and ‘debra’ had the highest open rate. Mailchimp’s team analyzed emails sent from users to find what subject line formats resulted in the best open rates. Most people know to avoid words like “free” in their subject lines because they trigger spam filters. But you should also avoid common words that are associated with sales, like “help,” “percent off,” or “reminder.” These words don’t always trigger a spam filter, but many subscribers will ignore them. Personalize a message with a recipient’s first or last name to improve open rates. MailChimp research suggests including a city name is even better. 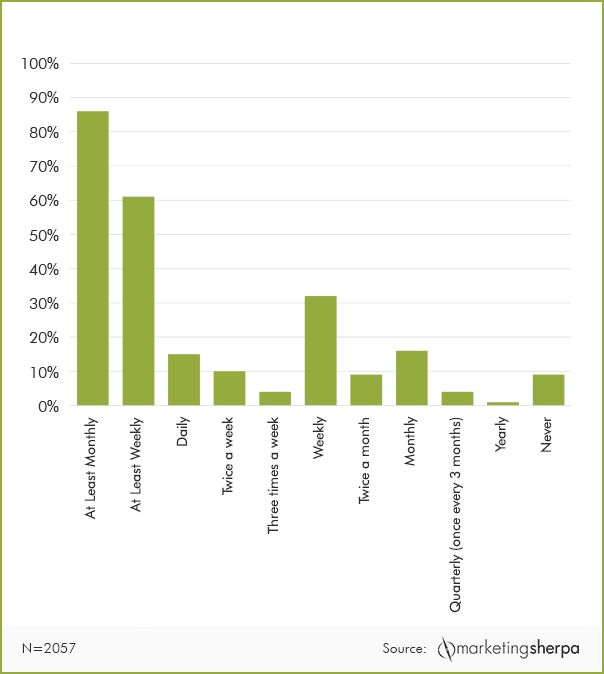 Newsletters tend to start with high open rates, but these decrease over time. Keep your content fresh, and don’t repeat the same subject line for each campaign. If subscribers can’t tell something about your content from the subject line, they probably won’t open your campaign. Most people quickly scan subject lines to decide if they’ll open or ignore the email, so don’t expect subscribers to dig through your subject line to figure out if they’re interested. Keep your subject line to 50 characters or fewer. Keep the message straightforward and avoid splashy promotional phrases, phrases in all capital letters, or exclamation marks in your subject lines. Subject lines framed as questions often perform better. The pre-header is shown as the subject line in Gmail and inboxes on mobile phones. Most email clients allow you to customize this. According to emailmonks.com, the top part of your email is one of the most valuable areas of your email. It plays a significant role in engaging subscribers. The most important element to include in your footer is the line that reminds your readers how they subscribed to your newsletter. Having a footer will help decrease chances of someone calling you out for SPAM. Other items to include in your footer. With most people having smart phones at their side, it is no surprise that 90%* of people are accessing email on their mobile devices, and 42%** of them are opening email newsletters on their phones. Your newsletter needs to be mobile ready. Make sure your email vendor uses Responsive or Scalable email coding standards. Using these standards allows for better shaping of your newsletter on various screen resolutions. You sent your email. You agonized over the content and layout. Now you cross your fingers. Is an open rate of 15% good? What about a click-through rate of 4%? Sounds good, right? The biggest question I have is: How does the performance of our newsletter compare to other businesses in our market? Mailchimp put together an excellent resource that allows you to compare your performance to your industry and company size. They scanned hundreds of millions of emails to determine the performance data. The overall strength of your email list is more than just looking at open and click rates. There are many other factors to consider to get traffic from a newsletter. FulcrumTech put together a great plan to monitor the true strength of your email list. This metric measures the portion of recipients who didn’t receive your email message. The bounce rate is further broken down into “soft” bounce rates and “hard” bounce rates. Typically caused by such issues as network problems or a full mailbox, soft bounces are likely temporary and eventually delivered. Hard bounces, however, will never be delivered. They’re returned to the email server because the email address is invalid or doesn’t exist. Typos in email addresses are frequently the cause of hard bounces, for example, indicating that your list needs some cleaning up. According to MailerMailer’s email marketing metrics report, bounce rates vary by industry, ranging from .9% in banking to 4.3% in real estate. The unsubscribe rate measures the number of people who “opt out” of your email list. In addition to measuring the quality of the subscribers on your list, it’s also a good indicator of how relevant your audience finds your content. Unsubscribe rates higher than 1% indicate that there’s a problem that needs to be identified and addressed. This metric measures how rapidly your list is growing. To determine your list growth rate, subtract the number of unsubscribes and bounces from the number of new subscribers and divide that number by the previous number of subscribers on your list. The inactive user rate measures the number of recipients on your email list who haven’t opened your emails over a period that you believe indicates they’ll likely never open again (e.g., six months for a monthly newsletter list). Sending to people who repeatedly don’t open your emails can lower your email reputation and decrease your inbox delivery rates. If you determine that you have a high number of inactive users on your email list, you may need to take action to help re-engage them. This open rate metric measures the number of people who open an email message. Are your subject lines effective? Is your message resonating with your audience? That’s what this metric helps to determine. See the open rate charts above to compare your open rate to industry averages. The click-through rate measures how many times the links in your email message were clicked. The more relevant your content and marketing messages are to your audience, the higher the click-through rate. If your open rates are high, and your click-through rates are low, you’re doing a great job of generating interest in your emails, but the content is not resonating. See the click rate charts above to compare your click rate to industry averages. 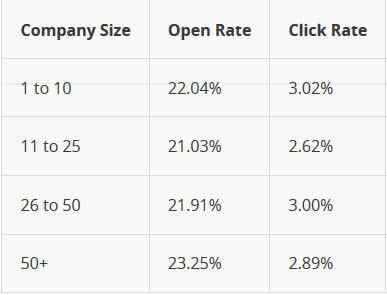 This metric is the ratio of unique clicks as a percentage to the unique opens. It measures how effective your message is in motivating recipients to click a link once they’ve opened your message. Click to open rates should be in the range of at least 25% to 30%. Are you getting the results you’re looking for? That’s what this key metric tells you. The conversion rate tells you how many of the people you sent the email to actually clicked all the way through to complete the desired conversion – such as making a purchase, completing a survey, or signing up for your e-newsletter. You worked so hard to get visitors to subscribe to your newsletter. Email subscribers are valuable. However, like death and taxes being a sure thing, so are opt-outs. The question is how do I reduce my overall churn rate. If you receive less than a 2% unsubscribe rate, you are within industry norms. The Direct Marketing Association states that list churn can erode up to 32% of a list each year. It takes a lot of list building to stay ahead of losses like that. The number one reason people unsubscribe is because they’re getting too many emails. A MarketingSherpa study found that 86% of people would prefer to receive an email from a company once per month. Simple changes to the frequency of emails can help get traffic and reduce churn. There are many ways to get a sense of how frequently your customers want to receive an email from you. The following infographic by Litmus offers a visual breakdown of some of the most common reasons why people unsubscribe from emails. Litmus and MarketingSherpa found frequency is the number one reason people unsubscribe. A study from MailChimp has established that frequency and engagement are negatively correlated, meaning that as businesses send email more frequently, their customers tend to engage less with each campaign. What can you do to reduce email churn? Set up a survey for when people do unsubscribe to poll them on why they decided to leave your list. Make any necessary changes to keep current subscribers happy. Instead of simply including a company name in the “From” field as most email marketing campaigns do, repeat your brand name in both the “From” and the “Subject” field. 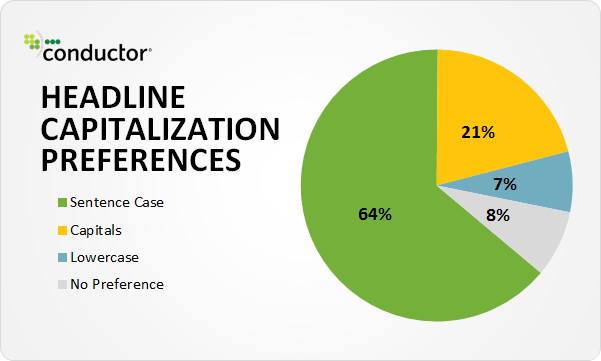 Repeating your name can result in a 20% gain in open-rates and an overall 15% improvement in click-through rate. The general rule of thumb is to send no more than one email every 10-15 days. Of course, this depends on the business you are in and the expectations you have set with your subscribers. If you are emailing more than once every ten days, you may want to consider reducing the frequency of your emails. Andrew Merchant: Question and answer sites such as Quora and Yahoo Answers can help you to attract readers to your blog. Just visit and sign up with these sites and then answer questions related to your blog. Leave behind links to your blog. In reviewing our Google Analytics, we noticed referral traffic from Quora was starting to grow. Quora is a question-and-answer site where questions are asked, answered, edited and organized by its community of users. Our referral traffic from Quora grew an impressive 3x between February and April! First, you have to decide if Quora is the right place for you to spend time. Are your customers there? Quora contains questions and answers for over 500,000 subjects and popular categories including technology, economics, and personal health. You should be able to find a niche to participate in. Quora is a great way to find out what issues are puzzling your current and potential user base. Use this information to determine the direction of future content. By answering questions related to your industry, you can demonstrate your expertise in the space and improve your company’s brand image. You can influence people to start thinking about the problem in a new way—one that considers your product niche. As long as you’ve clearly stated who you work for, you can also explain how your product can help solve someone’s problem. Quantcast estimates nearly 800,000 people access Quora each month. Their traffic has been steadily growing. Mastering Quora isn’t complex, but it does take time to build momentum. Try a few approaches. Follow narrow and broad topics and fine tune over time. You will get notified when there is a new question on the topics you choose. Build out your profiles. 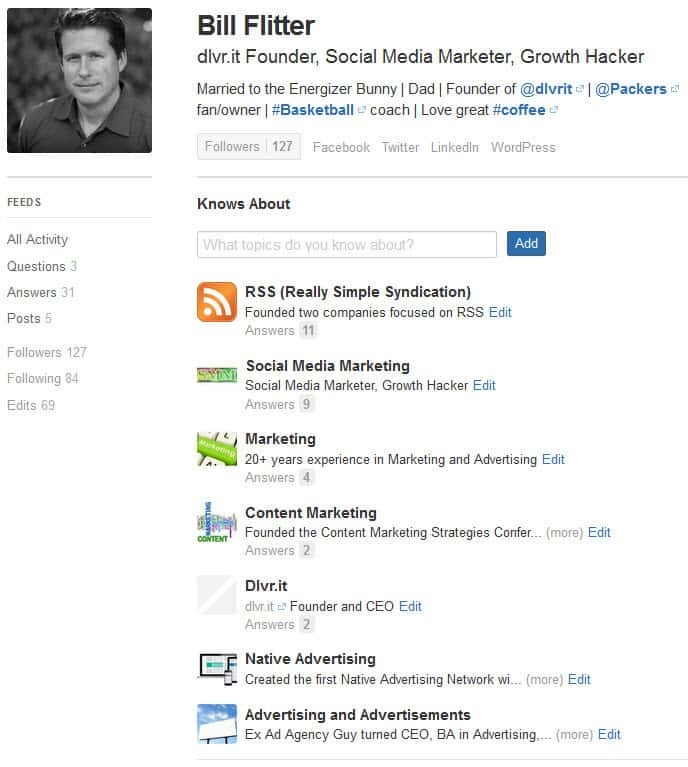 With each topic you follow, you can create a unique profile that highlights your expertise on that topic. This expertise is a great feature that compliments a diverse background and further adds creditability to your answers. Using myself as an example below, you can see I have seven different profiles – one for each topic I follow. We decided to create a Quora blog with the idea of exposing our existing content to a new audience. For instructions, Quora provides the answer: How do I start a blog on Quora? Do we have domain expertise in the area? Do we have data to backup our answer? Do we have a blog post as a reference? Are we one of the first to answer the question? We wanted to be one of the first to answer. We noticed this increased the upvotes on our answers. When I responded to questions in each category, Quora had already populated the correct profile in my response – again highlighting my expertise in that subject area. Most social networks only allow for one generic profile. This ability to have multiple profiles is a unique advantage. I can showcase my many talents that expand beyond just my professional activities at dlvr.it. 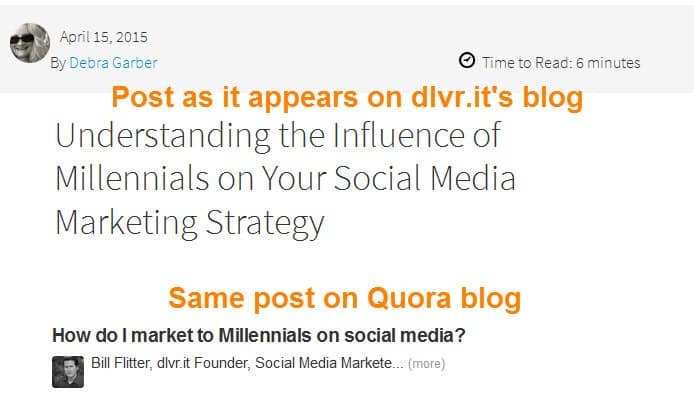 Strategy: When we added a blog post on the dlvr.it blog, we turned the content of the post into a question to repost on Quora. Each Quora blog post included a summary of the main points and link back to the dlvr.it’s blog for more information. 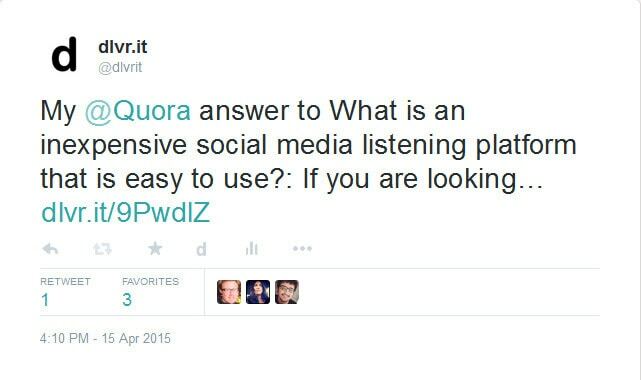 Strategy: Build awareness to the Quora answers with our existing social media audience. We used smart automation to build awareness of our answers. When I answered a question, the answer was automatically shared with our social media audience using Quora-to-RSS. Time Spent: One-time set-up in dlvr.it using RSS. How to create RSS feeds for Quora. We found that starting with “My @Quora answer to…” was the best format when sharing on social media. Andrew Merchant: Pingler provides a free service for distributing posts to News Reader sites and search engines. In fact, Pingler will boost the chances of your blog posts being found through search engine results. Pingler is a pinging service to get traffic automatically. Pinging is a way for your website to tell the world you have new or updated content. WordPress has this feature built-in and automatically notifies (pings) update services each time you add, modify or edit a post. The update services then take the information they receive from your site and tell other search engines, blog directories, news websites, feed aggregators, social networks, and all subscribers to those services, that your blog has been updated. Can you Add Additional Ping Lists? By default, WordPress uses Ping-O-Matic to notify all major ping services about your blog update. However, you can always extend your blog reach by pinging more services by adding them manually. A simple Google search resulted in many updated 2015 WordPress Ping lists including the Recommended WordPress Ping List 2015 from Genesis Themes. Step #3. Manually paste any reliable and authoritative pinging services that you want to add to the list. Avoid using long ping lists that contain services which no longer exist. The other problem with a large list is that you could end up pinging the same URL multiple times, and may get labeled as a ping spammer by those services. Not good! More than 70 million professionals visit Slideshare per month, and it is one of the top 100 most visited sites globally. Share your blog on this website and attract the attention of expert readers. 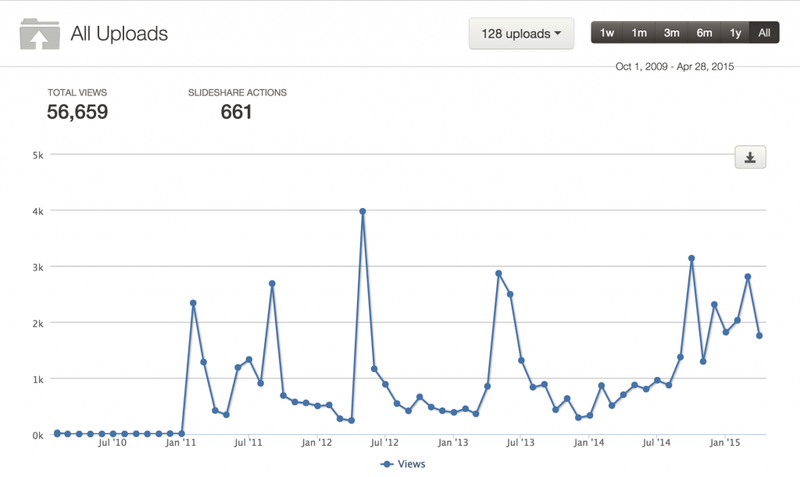 Do you use SlideShare to get traffic? If you’re busy like me, you may have missed the post from Forbes proclaiming SlideShare as the quiet giant of content marketing or maybe you’re just too busy with your social media workload to add another step into your daily routine. Frankly, I’m sold when it comes to an easy social media tool to increase ROI with little to no cost. comScore reports that SlideShare has five times more traffic from business owners than Twitter or Facebook. And because SlideShare is now owned by LinkedIn, it’s simple for B2B audiences to both find and use it. It is not just for sharing slides. You can share just about any content on SlideShare – presentations, infographics, documents, videos, PDFs, and webinars. Slideshare content also includes sharing your blog posts! SlideShare itself claims to be “the world’s largest community for sharing presentations and other professional content.” In Q4 of 2013, the site averaged 60 million unique visitors a month and 215 million page views. SlideShare is among the top 120 most-visited websites in the world. Since created in 2007, SlideShare has had more than 10 million presentation uploads, drawing 50 million visitors and 3 billion views a month. With SEO in mind, SlideShare content frequently ranks high in Google search results. The benefits of SlideShare are exponential (i.e. improve SEO, get traffic to your blog) but with limited time and resources, where do you start? To get your feet wet, I suggest sharing your blog content first. Sharing content is the fastest way to get traffic immediately with little work. Consider increasing the Text Size to its maximum of 130%. I find the larger font easier to read once it’s uploaded to SlideShare. At this time (before you hit PDF), you can also delete the Author and/or Remove Images if you need. Unfortunately, this is the extent of any possible editing within the plugin. Step #5: VERY IMPORTANT: Before you ‘Save’, make sure to optimize for SEO. Use the virality score as a guide. Adding keywords and more information (Category, Description, Tags) is key to making it easier for others to find your content. We don’t spend time creating original content specifically for SlideShare, but the traffic spikes we see from this simple method of uploading blog content leads me to believe we could be doing a better job. Getting more traffic is where SEO is important. Off-page SEO includes anything done outside of your website, proving to search engines that your digital footprint is relevant for certain keywords and phrases. This includes SlideShare. To start, Google is the first place I go when I need to do keyword research. Google’s Keyword Planner: It is mostly intended to help Adwords advertisers spend money efficiently when purchasing ads from Google but you can still use the data to find higher traffic keywords that are more likely to get traffic organically. Google Analytics: Although most keywords will be displayed as “not provided”, Google Analytics does still show some of the most important keywords that get traffic as well as which pages are performing the best. Google Webmaster Tools: Provides a wider range of keywords than Analytics if you want to get even more data from your current content. Keywordtool.io: With a single search, this tool can generate up to 750+ keyword suggestions from Google, YouTube, Bing and even the App Store. It’s free, reliable and pretty fast! Übersuggest: Created by an Italian SEO guy and touted as one of the best free keyword tools for getting lots of keyword suggestions. Check it out! The name of the file you upload to SlideShare becomes the URL slug, so when you name your file, choose something SEO-friendly with your keywords (from Step 1). Your SlideShare presentation will have a better chance of ranking in SERPs, which you get traffic to your presentation. For example: Using our simple technique of uploading blog posts to SlideShare as a PDF, we save the PDF using keywords in the filename. Include your main keyword in the description, ideally in the first sentence. Make sure to include a link back to your website or reference the URL to your blog post. In addition to using your keyword or phrase in the title and description of your Slideshare, make sure you include the tags as well. Make your keyword the first tag for the presentation, and then choose closely related tags to follow. 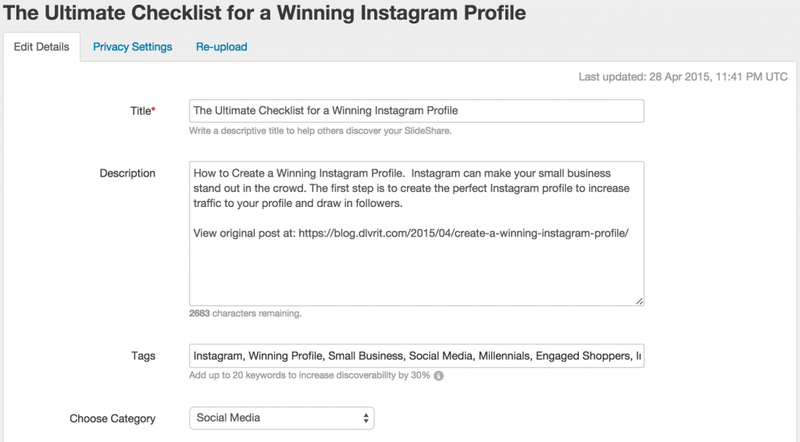 Notice in the example above the use of our keywords: Instagram and Winning Profile. For deeper insight into your content, SlideShare offers a robust analytics feature allowing you to track the daily progress of all of your content. You can see the geographical distribution of views to find out where your content is accessed, traffic sources to evaluate which channels are bringing the most viewers, and timing to measure what days of the week and months content performs best. There is a lot of great information packed into this feature. 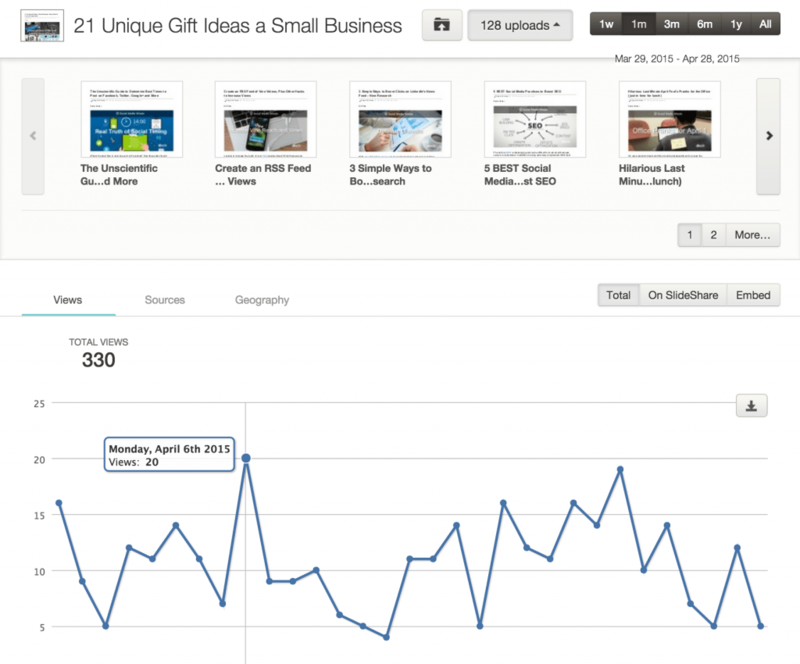 The image in the picture below is the analytics view for one of our more popular posts on SlideShare: 21 Unique Gift Ideas a Small Business Owner Would Love and Appreciate. We posted this to Slideshare on December 22, 2014 (just in time for the holidays). 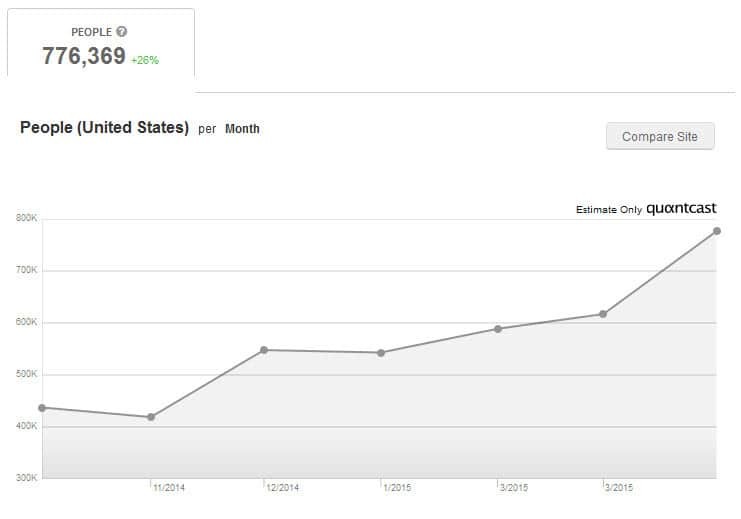 The data shown below was taken for the period March 29 – April 28, 2015 (3-months later), proving that posting content to Slideshare is an easy way to get more eyeballs on your content and ultimately, get traffic back to your site. If you haven’t read Part 1 of this post, head over to the Ultimate Playbook for Growing Your Blog Traffic. I would love to hear your thoughts on the tips we provided to get traffic. Would you add anything to what we discussed thus far? Do you think these tips will save you time?